Have you been thinking about making the switch to Nex-Tech Wireless but just can't part ways with your smartphone? No problem! 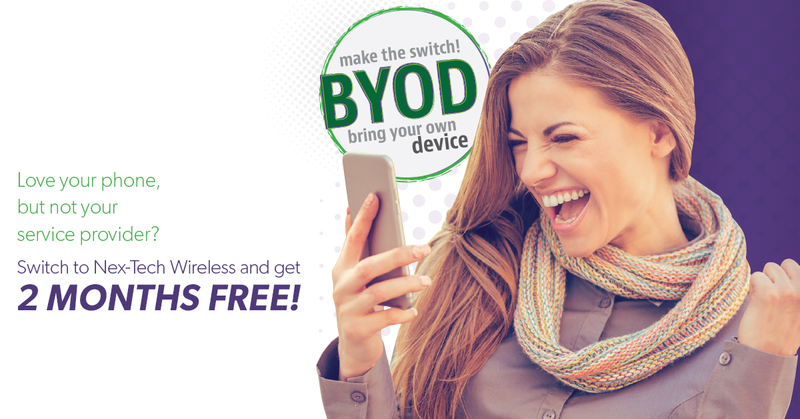 Bring your device and get 2 months free! To get started you'll need to verify that your device is unlocked, has the latest software update and if you have an iPhone, ensure that Find my iPhone is removed. Not sure if your device is unlocked? Contact our Tech Support team at 877-621-2600 for help! Once you've verified all of these things head into a Nex-Tech Wireless location near you to start the activation process and enjoy 2 months of free service! Need a new smartphone? We can help with that too! All smartphones are now 50% off!